1. 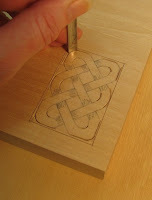 Lay out the design on your workpiece and define the outer and inner edges of the shape with chisels and gouges. I shaded the "under" parts of the knots with pencil so that I didn't a ccidentally cut across the "over" parts. 2. Match curves with gouges that have the same sweep. 3. Bevel down, remove the background areas that surround the shape. 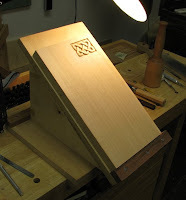 I used both chisels and gouges for this and tried to maintain a consistent depth of cut. 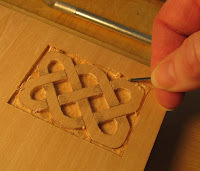 Don't fret too much if it's not perfect; you'll have another shot at it as you're finishing the carving. 4. My 1/16" chisel got a work out along the outer edges. 5. I used dental tools to pick out some obstinate chips. These tools are cheap and your dentist may even give you som e of his/her worn-out ones*. You can reshape the cutting edges to meet your needs. 6. Bevel up, I removed the pencil-shaded areas of the drawing with a tapered slice—starting at the high point (the "over" knot) and slicing downward toward the pencil shading—but did not cut as deep as the background areas. Once all the pencil-shaded areas (the "under" knots) are removed, the woven design emerges. You can stop at this point if you like a more hard-edged look. And here's where you can tweak the depth of the background area. Since parts of the design have been made more shallow, you have easier access. 7. 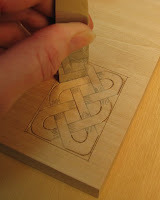 If you prefer, you can round over all the edges with chisels and gouges to create a rope-like effect. *I needed dental tools for a class taught by Steve Latta. Steve suggested that we ask our dentists for his/her throw-aways. So I called my dentist's office and rather than give the receptionist a long explanation, I merely asked if I could buy any of their used dental tools. "Hold on," she said. Moments later, "NO!" and she hung up. I figured she thought I was planning to pull a Hannibal Lecter on someone and freaked out. At my next appointment with my dentist I told him what happened. "Oh, that was you?! That phone call was the talk of the office!" His response confirmed my Hannibal Lecter suspicions. And it totally made my day. WOW! Very cool posting. I am really enjoying your carving journey. I also like your set up with the angled support and low angle light. Keep up the great work. By the way, very cool story about your dentist office! Firstly, now that they understand that you're not trying to torture people, are you able to get dental tools from your dentist, or are they, as I suspect, loathe to share due to the potential liability? Insurance companies don't like that kind of thing. It makes them nervous. Secondly... are all of your practise pieces that high a quality? When I'm trying a process out it's usually on a waney piece of construction grade white pine 2x4, and there you have a piece of wood nicer than the stuff I try to make furniture out of. Thanks guys. By the way, that angled support is just sitting on top of a bench hook; no clamps were needed. Neither the jig nor the workpiece moved around while I was working. I wound up buying the dental tools for $1 apiece at a dental supply store. I asked for their broken ones since I had planned to refile the profiles anyhow. You do have to sharpen them, though. They may feel like razor blades when your dentist is using them on you, but they are in reality not very sharp. Mike, it took me a ridiculously long time to carve this—I think 4 or 5 hours—so I tweaked it to death. Sorry if I'm asking the obvious here, but what kind of wood is that, Kari? Oh, and way to make it look incredibly easy! 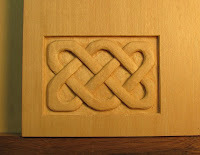 My first thought - I've been working on too small of a scale and I was not using wood suitable for such carving. 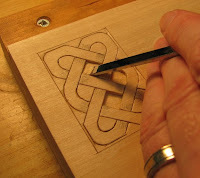 In all honesty, a basic carving class might be a good thing to think about for myself here in the near future. Ethan, that is basswood and it cuts like butter. Walnut and cherry are fairly easy to carve but don't look as nice as basswood, imo. 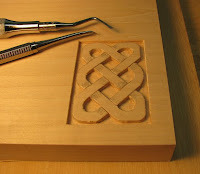 I've tried to carve oak and rock maple, which are both very hard on tools. 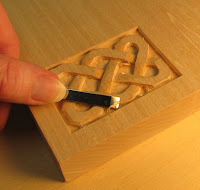 Great tutorial - I've only done a little chip carving and found your post very inspirational. Oh, for more time! 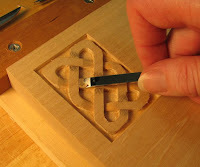 Thanks for another great carving tutorial. And I've heard that it's best to ask for the dental picks when you come in - so they won't use the dull ones on you.